On summer evenings as adults sit around bonfires and kids run in the yard playing flashlight tag, eyes turn skyward. Teach your friends and family the most important summer constellations with this handy guide on what star formations are overhead. Start with the easiest constellation just to orient yourself in the star-filled sky. The Big Dipper is neither a true constellation or a specifically summer constellation, but it will help you get started. The Big Dipper is easy to located in the northwest on summer evenings and is circumpolar, meaning that it never sets. The Big Dipper is a part of Ursa Major and will lead you to the North Star and Ursa Minor with the end two bowl stars, or follow the curve off the handle to get to the star Arcturus in the constellation Bootes. Then continue the line from Arcturus toward the horizon to find the star Spica in Virgo. You already have four constellations located! On summer evenings you can also look for the brightest star that is closest to overhead. This star is Vega, one of the stars in the constellation Lyra, and one of three stars in the Summer Triangle. Look east of Vega to find the other two stars. The brighter star in the triangle to the southeast is Altair in the constellation Aquila the Eagle, and the star to the northeast is Deneb in the constellation Cygnus the Swan. The three points of the summer constellation net us three more constellations, and now we are up to seven. Zodiacal constellations are those constellations that lie in the plane of our solar system, allowing the sun, moon, and planets to pass through them. There are five zodiacal constellations that can be easily viewed during summer months: Libra, Scorpius, Sagittarius, Capricornus, and Aquarius. Start with Sagittarius, because it contains a grouping of stars that look much like a teapot, which makes it easy to identify. Sagittarius lies in the south right over the Milky Way Galaxy. If you are in a dark enough location, you can see the cloudy band of the Milky Way stretching from the south to near overhead by Vega. Once you find that teapot shape along the southern horizon over the Milky Way, you’ve found Sagittarius. Then you just need to look to either side of Sagittarius to find the other two zodiacal constellations. 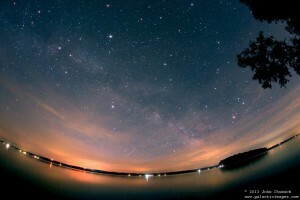 Along the horizon and to the west you’ll first find Scorpius, its tail curving near Sagittarius and its head near Libra. Just past Scorpius the Scorpion’s head are the scales of Libra, which are marked in August of 2014 by the visiting planets Saturn and Mars. East of Sagittarius are Capricornus and then Aquarius, two largely unremarkable constellations that supposedly look like a Sea-Goat and Fish, respectively. If you can uncover these last two zodiacal constellations, you are up to twelve summer constellations! For a bonus constellation, look under the Summer Triangle for a tiny configuration of stars that looks like a kite, or perhaps a diving dolphin. This small constellation is known as Delphinus the Dolphin. This brings you to lucky thirteen, and a fairly extensive collection of constellations to observe on a midsummer’s night.